Michael Bernard Mukasey (/mjuːˈkeɪzi/; born July 28, 1941) is a lawyer and former federal judge who served as the 81st Attorney General of the United States. He was appointed as Attorney General by President George W. Bush following the resignation of Alberto Gonzales. Mukasey also served for 18 years as a United States District Judge of the United States District Court for the Southern District of New York, six of those years as Chief Judge. He is the recipient of several awards, most notably the Learned Hand Medal of the Federal Bar Council. Mukasey was the second Jewish U.S. Attorney General. Mukasey is currently a partner at the international law firm Debevoise & Plimpton. He received his B.A. from Columbia and his J.D. from Yale. 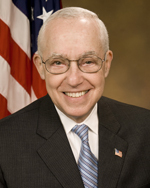 In May 2004, while still a member of the judiciary, Judge Mukasey delivered a speech (which he converted into a Wall Street Journal opinion piece) that defended the USA PATRIOT Act; the piece also expressed doubt that the FBI engaged in racial profiling of Arabs and criticized the American Library Association for condemning the Patriot Act but not taking a position on librarians imprisoned in Cuba. In November 2008, during a speech to the Federalist Society, Mukasey had "a fainting spell" caused by a late-night speech given under hot stage lights. Mukasey was rushed to the hospital and released the next day after tests ruled out a stroke or heart attack. Doctors characterized him as "very fit." ^ Shenon, Philip; Benjamin Weiser (September 18, 2007). "A Washington Outsider With Many Sides". New York Times. Retrieved September 18, 2007. ^ a b Mukasey, Michael B. (May 10, 2004). "The Spirit of Liberty". Wall Street Journal. Archived from the original on August 8, 2004. Retrieved November 6, 2018. ^ Perez-Pena, Richard (July 31, 1993). "Judge Warns about Leaks in Bomb Case". New York Times. Retrieved May 12, 2010. ^ a b Shane, Scot; David Stout (November 1, 2007). "Bush Moves to Save Mukasey Nomination". New York Times. Retrieved November 1, 2007. ^ For primary source documents, see Velvet Revolution website. For commentary, see David Swanson, "UPDATE: Disbarring 12 Torture Lawyers: Broad Coalition Of Groups Files Disciplinary Complaints Against Twelve Bush Administration Lawyers Who Advocated Torture Of Detainee", May 18, 2009 at Daily Kos blog and Dna Milbank, "Etch-a-Sketch: Punishing Bush Officials", Washington Post op-ed, May 18, 2009, found at Washington Post website. Accessed May 18, 2009. ^ Scott Shane, "Advocacy Groups Seek Disbarment of Ex-Bush Administration Lawyers", New York Times, May 18, 2009, found at NY Times website. Accessed May 18, 2009. ^ "Update 1 - US atty general had fainting spell - official". Reuters. November 21, 2008. Retrieved November 21, 2008. ^ "Attorney General Michael Mukasey Receives 'Clean Bill of Health' After Thursday Collapse". ABC News. November 21, 2008. Retrieved November 21, 2008. This page was last edited on 9 April 2019, at 19:06 (UTC).